The Daily Rant: Hurricane? What Hurricane? 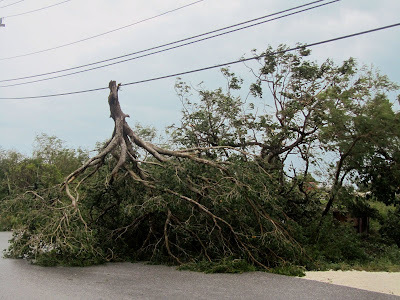 Well we made it through Hurricane Irene, a Category 1 storm when it passed over the Turks and Caicos Islands, where Ed and I are taking our first island vacation. We watched the news like old people, hanging on every word. My mother was emailing, I spoke to her on the phone several times and I was getting well wishes and updates from my friends via texts and Facebook. 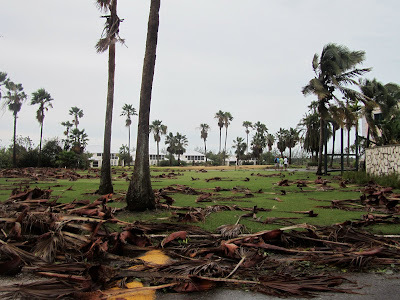 The reports were pretty scary and it looked as if it was going to be a category 2 or 3 by the time it got to us. Seeing that swirl of red, orange and yellow on TV, closing in on the little string of islands, tiny really, was a little troubling. Outside, the winds were picking up and there was some rain, but it didn't seem like a hurricane was coming. In fact, the people here didn't seem to be moving too quickly to do anything. The hotel staff was supposed to take the furniture from the patio but never did. They also said they'd board up the sliding window, but they didn't do that either. We finally took the furniture in ourselves. In fact, the guy who came to our room told us just to pull the curtains and it would be "fine". Turns out, it was fine. We kept our sliding door open all night, until we went to sleep. I wanted to hear the wind so I could determine its intensity by the sound. With the sliding door closed, we couldn't hear a thing. We finally went to sleep about 2am. I was a little nervous lying there not hearing anything, but eventually fell off to sleep. I woke at 4am to the sound of the fire alarm in our building going off. Apparently this happened at another hotel too, which we found out when we overheard some people talking over lunch. Except they ran out of their room, into the storm, with their backpacks on their back full of the few belongings they thought they'd need. I opened our door, said "What's going on?" to the neighbor (who knew nothing), went back into the room and got back into bed. I fell back to sleep until the first light. 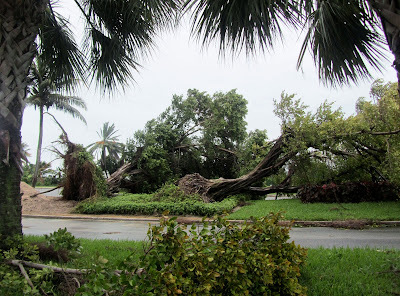 Once we had coffee and breakfast, we headed out to survey the damage. 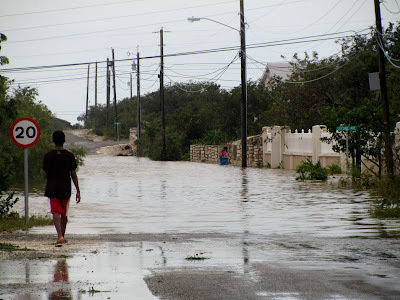 As you can see in the first picture that leads this post, there was a lot of flooding; there were parts of the island that we had been to yesterday that we couldn't access today. Roads were not only flooded, but many were blocked by downed trees. These next two images are from the local golf course were there were tons of uprooted trees. Big trees. With big roots. Just toppled like toothpicks. Debris everywhere. Every time I say the word "debris" I think of my nephew Jake. He's been using that word since he was a little kid; what five year old tells his Nana that they need to go outside to rake up the debris? Jake would have had a field day at this place. There was even a few palm trees snapped in half. You know what it must take to snap a palm tree in half? They sway and bend, snapping back like an elastic band. You see it in all the movies, they practically get horizontal. I saw a lot of bending with my own eyes yesterday and nothing looked like it was snapping. But here you have one. One of the local resorts we went to today for lunch put their chaise lounge chairs in the pool. Seems like a good idea, rather than having them blow in there, but wouldn't it have just been better to put them in storage? Kinda makes the hotel staff (and management) look a wee bit lazy. We ended the ride at the end of the island, where the ferry leaves from. 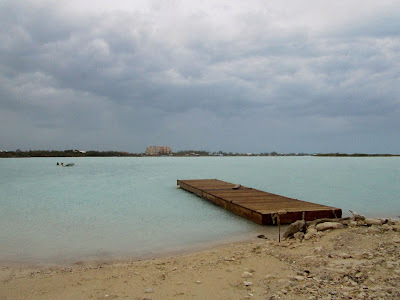 It's not a very attractive ferry port, trash everywhere, a mud parking lot. And that was before the storm. 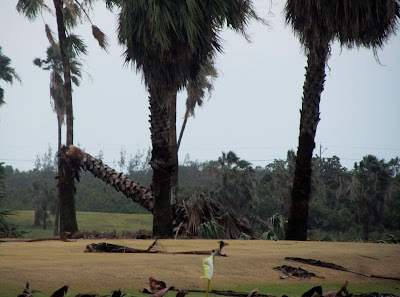 I have to say, this hurricane was kind of a non-event. I was nervous excited, hoping to see some serious wind and rain action, but I guess I'm kind of glad it wasn't a category 2 or 3 like it was supposed to be. 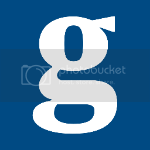 Once it lost some of its oomph and passed over us as a category 1, I was glad. There was plenty of wind and rain with just that - in fact, the wind was blowing the rain so hard towards the building at one point, that water was seeping under our door. We are completely impressed with the hotel though. We're on the third floor, an interior room, with a balcony. The sliding doors are so thick, as I said, we didn't hear a thing when they were closed. Some other people we talked to at another hotel said the wind sounded like a freight train. Either they were exaggerating or we really heard nothing. Nothing moved in our building. The electricity briefly went off for about thirty minutes, but other than that, we had electric, air conditioning and TV all night. Even the internet was working. Amazing. If we ever come back to this island, we'll definitely be staying here. It's close to everything, the beach is just across the way and it's a small enough hotel to feel like the staff knows who you are. Best thing about today? We made it through a hurricane!! And now I have a story to tell. Great job describing the events! Glad to hear you made it okay. Happy water drinking and I hope that you pushing Irene out to sea as we don't need anymore work up here!!! Loved this post. I feel like I was there with you. My prayers worked and for that I am grateful. So glad to hear that y'all made it through ok. I prayed you would be safe and God heard me. Enough excitement for awhile, right? Hope you enjoy the rest of your vacation. Love to both. Salena and Eddie: Be real careful where you eat the next few days. Might be overcaution, but you want to make sure the restaurant had a backup generator or something to protect its food, especially perishables/seafood. Say this from painful memory. Ate a delicious, extra-garlicky shrimp dish at a cafe in the Dominican Republic several years ago. The garlic hid the fact that the shrimp had spoiled, and I had the worst food poisoning I've ever had. Literally could not stand up for more than a minute for 3-4 days (not exaggerating), and didn't eating for about ten. Had noticed that my hotel and a lot of the nicer properties bragged about their "backup generators." Now I know why that was a big deal. 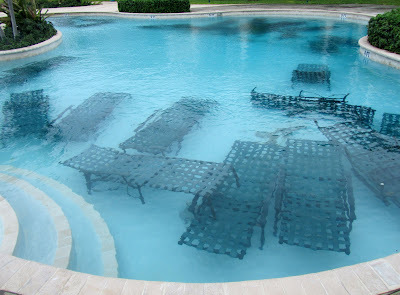 That said, the photos are awesome, Somehow I find that picture of patio furniture in the pool calming. Hope you enjoy every remaining day of your vacation, and do keep taking us along. nice footie shot...Salena..tell Ed to get a island pedicure...have fun.. The water damage repair restoration of individual valuables and furnishings usually depends on the expense of the restoration process itself. If the cost of restoration is higher than the original expense of the product, it is not logical to try recovering it. An ideal combination of expert opinion and advanced technology is what makes water damage restoration effective. These kinds of water damage repair service as well as mold recuperation experts are top-notch. I desired anyone to arrive deal with a few surging problems and discovered they've already been only spectacular. They are enjoyable, promptly, as well as the professional and so they do the job properly the first time!! I would definitely suggest all of them.